Following the news reports about the arrest of 21 Muslim youths under UAPA in Narath (Kannur dt.) 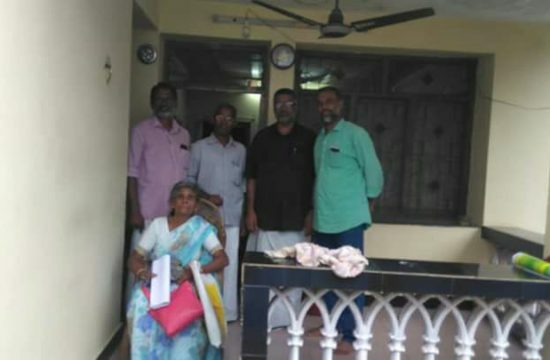 by the Kerala police, a team of National Confederation of Human Rights (NCHRO) visited the place yesterday and today, met the relatives of the arrested, people living in the neighbourhood of the place of arrest and police officers with a view to collect the facts regarding. 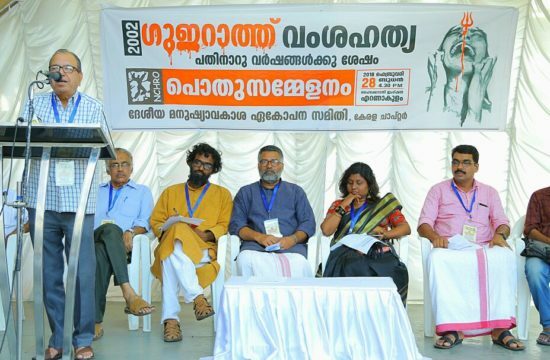 The team members are: NCHRO National Secretary Reny Ayline (Trivandram), Executive Members Prof. A.Marx (Chennai), G.Sugumaran (Puducherry), Kerala state committee member Advocate M.Abdul Shukoor (Malappuram), Writer and Activist K.M.Venugopal (Kannur) and Journalist Mohammed Shabir (Mangalore). 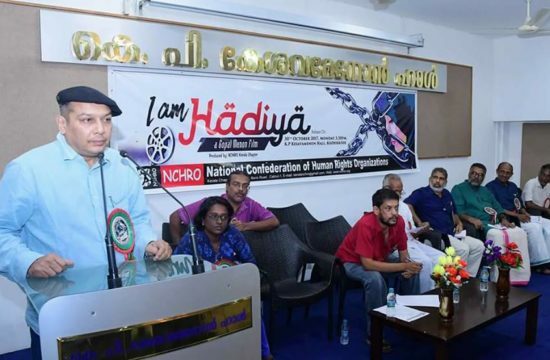 All the youths arrested are sympathisers of Popular Front of India (PFI), a registered organisation . They are conducting a programme every year known as “ Healthy People, Healthy Nation” in which they impart physical fitness training, yoga, some martial arts as well as religious and moral education to young people. This year also they were conducting the programme in a building owned by one Thanal Trust which is also a registered body under Charitable Trusts Act. This building is situated in a densely populated area in Narath behind the Falah English Medium High School. It is a half-built building without proper doors or the windows and everything that happens within the four walls of the building is visible to everybody outside. All the youths who took part in the programme were coming from the neighbourhood villages and they used to return to their homes in the nights. 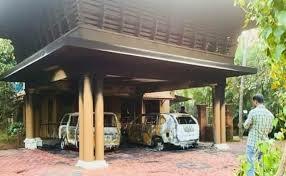 According to the eye witnesses of the arrest which includes Mrs P.M.Saleem, Mrs. Abdul Jaffar, M.Abdullah, K.P.Mussam Kutty, all neighbours living around that building, a team of four policemen first entered the building on April 23 around 12.30 pm. The people around thought that it might be a regular visit of the police who used to come there often in search of sand mafia who are very active in that area. But soon a large battalion of police came there and took all the people in the building with them. The police version of the story goes like this. As per the FIR filed by them (Mayyil P.S. FIR No 276/13), these people were given instructions on bomb making and training in the use of arms. They were able to seize two country bombs, one sword, and some materials and instruments necessary to make the bombs. Accordingly cases were filed under sections 143, 147, 153(B), R/W 149 IPC, Sec 5(1)(a) r/w 25(1)(a) of Arms Act, Sec 4 & of ES Act and Sec 18 of UAPA) against all the 21 Muslim youths and they were remanded to custody. But not only the parents and relatives of the accused but also the neighbours mentioned above told us that no such armed training took place there, all the physical exercises and classes were very peaceful. One of the neighbours M.Abdullah said that he used to send his wife for the religious classes conducted there. The only Hindu living near the building one Suthish s/o Raghavan also said the same. He also denied that any bomb making or arms trainings were imparted to them. 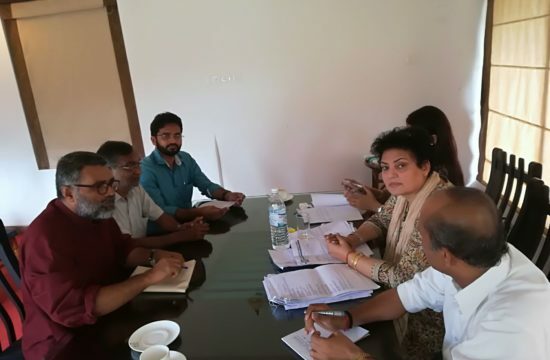 The Jamath member Mussam Kutty and the principal of Falah English Medium School Mr.P.Mustafa also said that the programmes were very peaceful and no such arms training were given to the inmates. We also met the President of the Narath Grama Panchayat Mr.K.V.Mamy and a ward member Abdul Salam Haji. 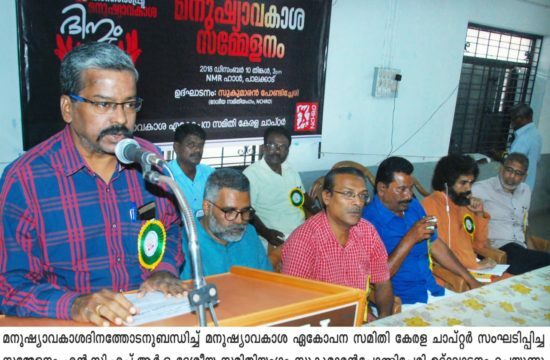 The former is a member of CPI(M) and the latter that of IUML. They also said that no such arms and bomb making trainings are possible in their panchayat limit. Nothing of that sort happened, they said. The president also attended a training programme conducted by the Thanal trust few weeks back known as ‘Happy Family’ in which Dr Ashraff, a psychologist took classes for women. Thanal trust also use to distribute school kits to poor children and conduct ‘School Chalo’ programmes to school drop outs. The President also said that there prevailed a political enmity between PFI and IUML because the front was responsible for the defeat of the IUML candidate in the last Panchayat election. M.Sanfaras, Manager in a private company in Bangalore : “My brother Rshid (22) is a +2 student. Our father is no more. They raided my house and found nothing. My brother had no connection with any organisation. My mother and other family members came to know about his arrest only through the media. 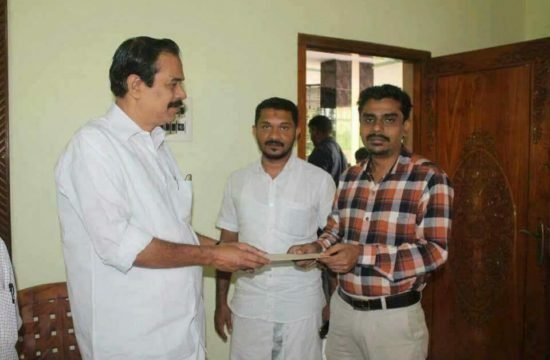 Mr. Kalyattu Surendhran, the Station Officer of the Mayyil police station denied the allegations of the relatives of the accused. He said that it was true that arms and bomb making trainings were given to the accused. When we asked him that how such clandestine activities were possible in such a crowded place and that too in an open building without window doors , he was not able to give a proper reply. When we asked him about what sort of bombs were seized from them, he said that they were giving training to make “something like bombs” and two of which were seized by them. When we asked about other incriminating materials seized he showed a register in which it was stated that a cd about ‘love jihad’ and a pamphlet on the role of Sangh Parivar in blast cases were seized . The pamphlet ‘Spoadana Bheekatrathayil Sangaparivarathinte Paghu’ was written by one Sadarudin Vazhakkad and published by Jamathe Islami. Earlier it was published as a serial in the magazine ‘Praboadhanam’. When we pointed out that these were not banned documents and were available freely in the market, he replied, “may be”. hat list of 172 ‘incriminating’ documents contain only items like Indian currencies, ID cards, paper cuttings..etc. The DySP also said that he had received a complaint from the local mosque committee that the activities in that building are to be watched. But when we met a Jamath member he denied that any clandestine activities took place in that building which we have already quoted. Our Observations : 1. The Supreme Court directions given in D.K.Basu case were not followed in these arrests. The police has lied to the court that the parents were informed about the arrests by phone whereas they came to know about it only through the media. 2. It was not at all possible that any training on the use of arms and bomb making can be imparted to the youths in such a thickly populated and open place and that too in a building without doors or the windows. Such physical and moral training classes were conducted by PFI in the same place at least for the past three years and no complaints were received by the police about any clandestine activities. When the police visited there once, they didn’t find anything. All the neighbours living around the building also deny such allegations. We also wonder what sort of arms training could have been given to at least 21 people with a single sword and a few wooden sticks. It is ridiculous to say that some freely available pamphlets and compact discs are shown as incriminating materials. Since nobody had seen the police seizing “something like bombs” in the building, we strongly believe that the bomb story is hoaxed by the police to justify their action and malign the movement. 3. We are much worried about the way in which rumours are spread against the arrested youths by the intelligence through the media. Some sixty lakhs rupees found in the account of one accused is focused as large illegal foreign money involved in this act. Actually he is involved in a travel business and holds a consultancy for admission in self financing engineering and medical colleges. He receives money from migrant labours in foreign countries to build houses through a friend of him. The police were not able to find anything illegal in that account. Few days back one newspaper has published that the Narath accused were involved in Coimbatore serial bomb blast case. All the accused are young people and most of them were school going children when Coimbatore incident took place and some of them had not even born at that time. A Kish identity card seized from one of the accused is also projected as related to some anti national activity. But having a Kish ID is a normal thing used as an intermediary pass to move to UAE for those who have no permanent visa to that country. 4. Except one of them , all other 20 young men arrested were not at all involved in any other pending cases. 1. We strongly believe that all the allegations against these youths are false and the fake case foisted against these innocent youths should be immediately withdrawn and those arrested should be unconditionally released. Special care should be taken to allow the students to write their examinations. 2. We cannot find any logic to evoke a draconian Act like UAPA in this case. Since nationwide concern is expressed against this Act, we demand that UAPA should be repealed immediately. 3. The case against these 21 youths was deliberately foisted with a view to harassing them and spoiling the name of PFI. With spreading rumours against these innocent youths we find them stigmatized as ‘anti nationals’, which in turn will spoil their future. It is alleged that during interrogation, the police had chosen the poorest among them and offered two lakh rupees and a new house in exchange for accepting the charges and becoming an approver. We demand a judicial enquiry in this arrest by a sitting High Court Judge. The police officers responsible for foisting this case should be punished and the innocent youths should be given compensation. 4. Kerala is the state with highest literacy rate and the political, civil rights and trade union consciousness among the people are larger when compared to other states. We humbly issue a call to the political parties, writers and other intelligentsia to condemn the indiscriminate use of draconian laws such as UAPA against innocent youths. 5. From our conversation with the higher police officials we understand that they are biased against the Muslim minority in the state. We demand that sensitisation programmes should be conducted for the revenue and police personnel on problems faced by minorities, dalits and adivasis. Also, sufficient number of officials from minority communities is to be posted in areas in which the above sections of population are in large numbers .